We invite you to visit our beautiful, secluded Buckhead office in Atlanta, Georgia. You can request an appointment online for marriage counseling or a marriage intensive. Or you can call us at (404) 325-3401 with any questions you may have. You can also send us a message using the online form below. Our office is suite 295, on the second floor. As you exit the elevator, we're the first door on your right. 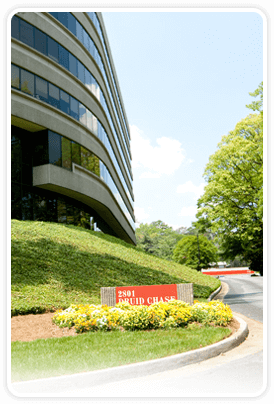 Our office is located in Druid Chase Office Park, at I-85 and North Druid Hills Road. Our building, 2801 Druid Chase, is especially lovely and secluded. There is ample free parking by the front door of the six-story building. The Woodsfellow Institute for Couples Therapy is located on the second floor, looking out on a grove of trees. From I-85, traveling south: Take exit 89 and turn right on North Druid Hills Road. Turn left at the first light, onto West Druid Hills Road. (You'll see the DoubleTree Inn and the Atlanta Diner.) Go 3/10 of a mile. Turn left at the sign for 2801 Druid Chase. Follow the driveway around and park in front of our building. From I-75, traveling south: Take the left-side exit for I-85 North. Then follow the directions from I-85, traveling north. From I-85, traveling north: Take exit 89, North Druid Hills Road. Take the left fork on the exit ramp that says "42 North." Turn right at the light on N. Druid Hills Road. Turn left at the second light, onto West Druid Hills Road. (You'll see the DoubleTree Inn and the Atlanta Diner.) Go 3/10 of a mile. Turn left at the sign for 2801 Druid Chase. Follow the driveway around and park in front of our building. From GA 400, traveling south: Take exit 1, and turn left on Sidney Marcus Boulevard. Turn left onto Buford Highway. Cross Lenox Road. Go 7/10 of a mile. Turn right at the sign that says "2801 Druid Chase," and enter the driveway to our building. From N. Druid Hills Road, traveling toward Buckhead: Cross I-85, and turn left at the first light, West Druid Hills Road. (You'll see the DoubleTree Inn and the Atlanta Diner.) Go 3/10 of a mile. Turn left at the sign for 2801 Druid Chase. Follow the driveway around and park in front of our building.